We call them the somewhat-shorter "Bristol, Bath, & nearby". (they all used to be part of "Avon" -- not a popular name locally ... sometimes unofficially "Cuba" (Councils that Used to Be Avon) ! FW usually has 52 pages (very occasionally 48 or 56 pages), printed, A4-size. ​FW has 3 sections: News, as below; Listings; Folklife Traditions. As much as possible - but not everything - will be copied online. It is a print magazine and it's not possible to exactly reproduce it online. Roughly 2/3rds - the area News & Listings pages - is on this site. A BRISTOL, BATH, & NEARBY CORRESPONDENT would be most welcome. 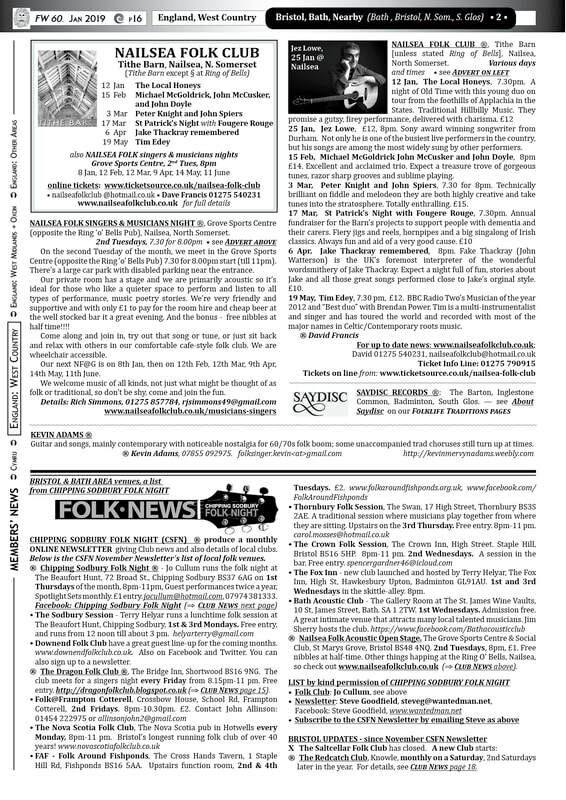 Meanwhile, we thank Chipping Sodbury Folk Night for the use of their "Folk News" for some area news. → BATH, various venues across the world heritage city of Bath, North East Somerset. ⊕ Bath Folk Festival is cited as one of the most exciting new folk festivals to emerge in the UK, drawing on a mix of internationally acclaimed acts and the wealth of local talent in the South West. It is a grassroots festival run by and for musicians and dancers who are passionate about the rich cultures represented. This will be an opportunity to no only hear some fantastic music, but more importantly it will be an opportunity to learn music at our traditional music summer school and to play in one of our many lively sessions. Guests tba. Every Issue, we cover Member-Festivals for the next 12 Months ! * Sat. monthly to start, then 2nd Sat. later.